One of Bell's early receiver designs made in wood. The magnet occupied the length of the handle and the diaphragm was housed in the larger diameter section at the bottom of the picture. This design is often called the "butterstamp" after its resemblance to the device used for pressing pats of butter. A reconstruction of one of Bell's prototype microphones. The metal diaphragm is mounted on a skin stretched over the pudding-basin-like structure at the bottom. The coil in which the electrical signals are induced is suspended above. 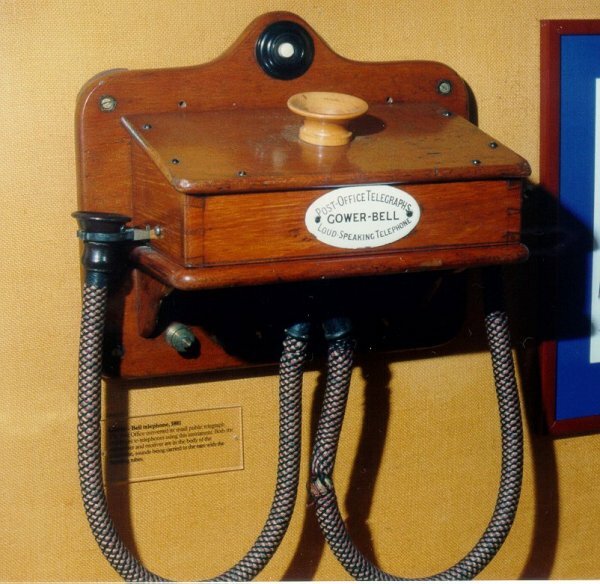 Evidence later emerged that Bell's original experiments with Watson used a microphone consisting of a wire dipped in liquid similar to that invented by Elisha Gray. This "gallows frame" microphone could transmit sounds but not clear speech. 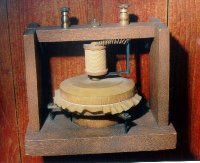 Bell's transmitter had limited output and consequently the range of communication was limited. 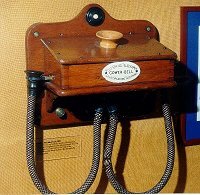 The invention of the carbon microphone by T. Edison, based on the work of Blake and Berliner, considerably improved the range of the telephone at the expense of requiring power in the form of a local battery. Two carbon buttons were placed in contact. One was fixed and the other attached to a diaphragm. Speech caused the buttons to be pressed closer together, reducing the electrical resistance and allowing more current to flow. 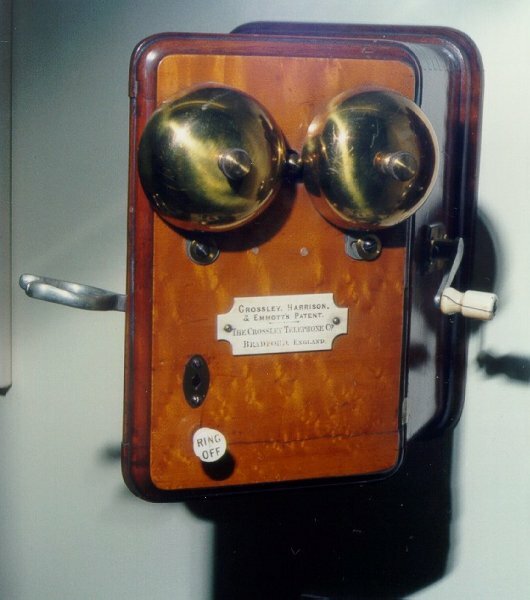 The legend reads "Crossley, Harrison & Emmott's Patent, The Crossley Telephone Company, Bradford, England." This was one of the first types of telephone to be used by the Post Office from about 1878 onwards. The microphone was concealed behind the fancy carving on the lid. Other illustrations of this model show the traditional butterstamp design of receiver. 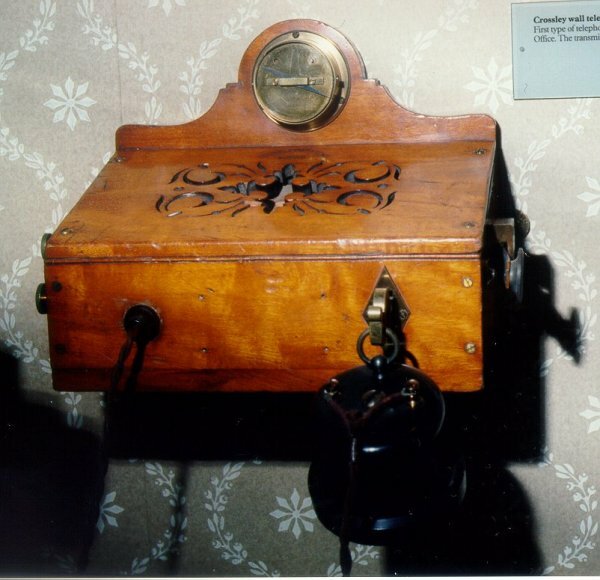 The Post Office converted many of its small public telegraph offices to public telephones using this design of instrument, circa 1881. The receiver was contained inside the case, connected to the two tubes which were held against the ears. The microphone was behind the small funnel in the top.